This is the last day in May. It went by so fast. As far as the weather is concerned, it feels more like the end of March. So here's a photo of Callie at the party we went to on Wednesday. 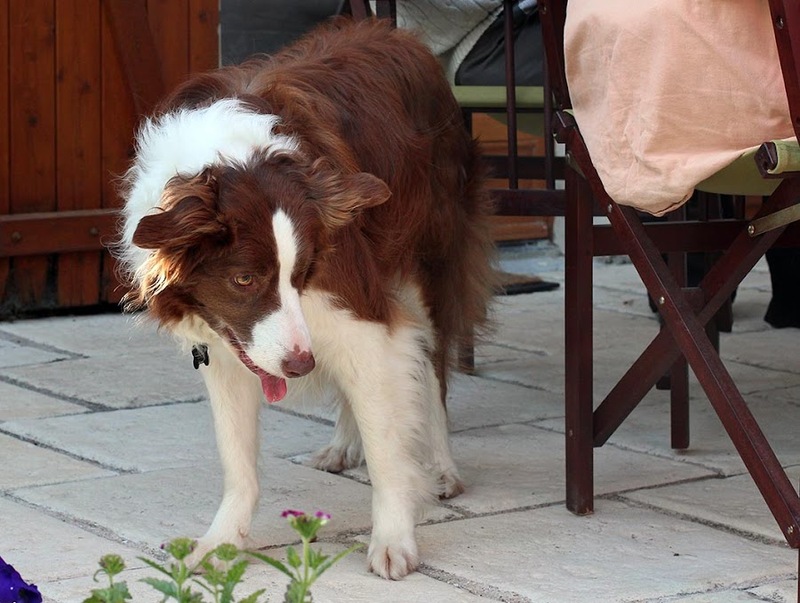 She enjoyed chasing the shadows of insects on the ground and playing with two small children most of the afternoon. Callie drools with delight as she chases shadows on the ground. We had a number of strong rain showers on Thursday and the kitchen ceiling is now leaking like a sieve. We have to find a roofer that will actually come over and work on it. We've had three roofers look at it over the past years. One said it was done wrong in the first place, another cleared some debris from the valley where the leak is. The third trimmed some of the tiles (last year) to make the water run faster, but that hasn't fixed the problem. Now he's too busy to come over. I suspect the tiles need to be removed from along the valley so that the old (and possibly compromised) flashing can be replaced with a new and wider one. Meanwhile, we have to unplug the appliances on that side of the room, cover them with plastic, and watch our kitchen ceiling be slowly destroyed while we try to find another roofer. Well, no, we weren't actually speaking of spiders. But why not? They're everywhere and they help keep down the populations of annoying flying things. This little guy blended right in with his surroundings and I nearly overlooked him. Or her. 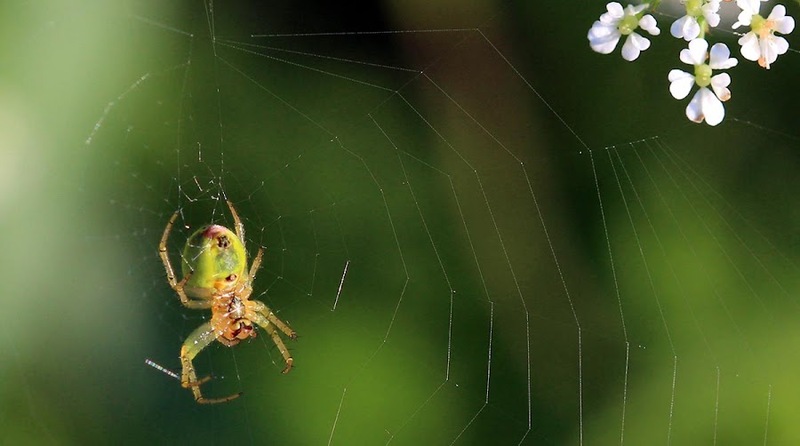 The underside of a tiny spider whose web was woven between the stems of wildflowers. We had a terrific afternoon yesterday at the vacation home of some English friends who threw a little party. The house is about an hour south of us in a beautiful town called Le Grand Pressigny. The weather cooperated and the sun smiled on us most of the day. 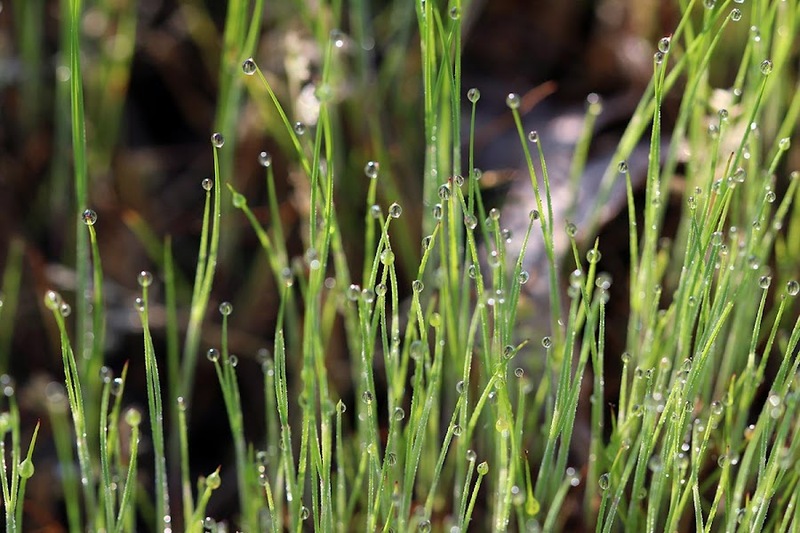 As the sun rises, when there are few or no clouds and after a rainy day or night, it warms the air and the humidity begins to evaporate from the ground and plants. The water is transformed into a mist that rises up in the early morning light. Looking east at sunrise Sunday 26 May 2013. Our house is out of the picture on the left. This is our road this past Sunday morning. The day turned beautifully sunny, but it wasn't enough to dry us out. Our ground is saturated and there is still a lot of standing water all around, especially in low spots. There are a lot of spent dandelions all around us now. They bloomed and went to seed and the rains washed a lot of the seeds away before they could be blown away by the wind. So there are a lot of these empty seed heads out there. It looks as though it should be edible. Maybe it is. And speaking of rains, we're under the weather again. The system rolled in right on schedule overnight. I'm glad we had the two days of sun; we got a some good things done outside, not the least of which was cutting the grass and running the tiller through the vegetable garden plots (again). They're almost ready for planting. In fact, I did plant one plot with several winter squash varieties (seeds). One of our neighbors told me she and her husband are sick of their garden and yard this year ("On en a marre," she said). The ground is too wet to work in the flowerbeds and the lawn grows so fast that his lawnmower gets clogged with clumps of wet grass. 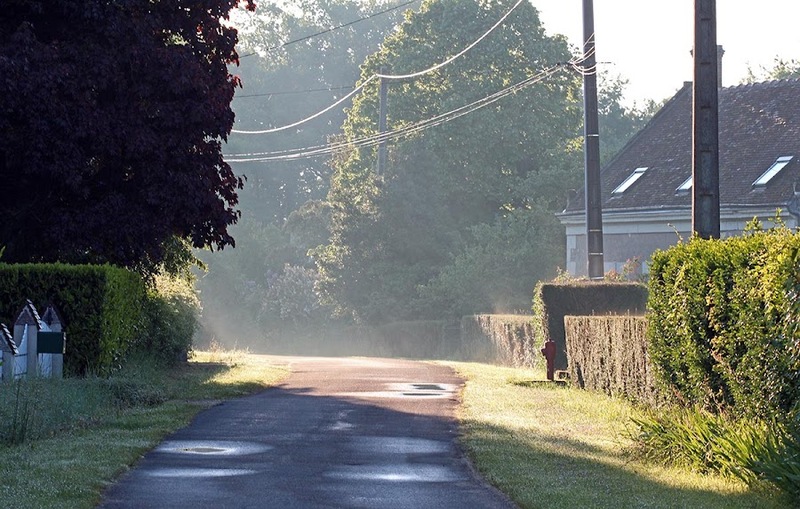 These are the elderly neighbors that live up in Blois. They have almost ten times the land area that we do; about half is wooded but the rest is grassy. They were here yesterday along with the guy that helps them in the garden, but they're not always here to take advantage of the good days when we have them. It's not the best picture of an insect, but I like it nonetheless. I guess it's because of the leg articulations. The legs came in focus, whereas the antennae and the body didn't. Proof that the depth-of-field of a macro lens is paper thin. 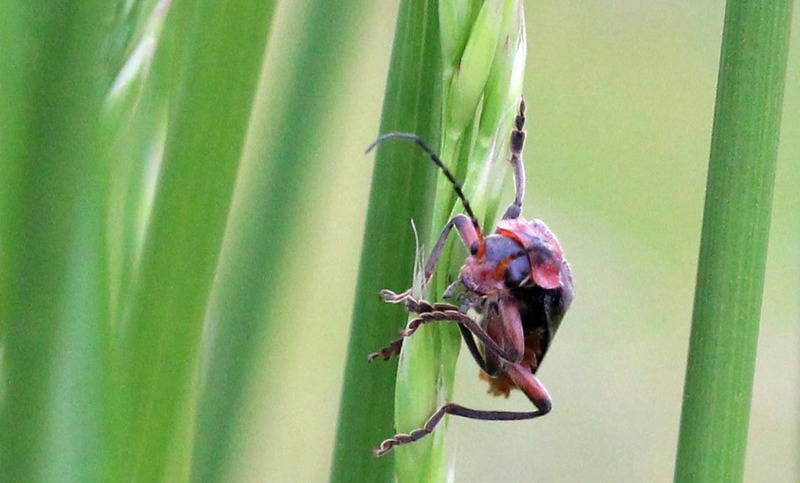 An insect on a blade of grass. I'm watching Roland Garros, known in the US as the French Open, now and for the next two weeks. I remember watching some of it (probably just the finals) when I was in high school in the 1970s. I actually played a little tennis back then. I was not very good at it. I started playing again about ten years ago, just before we moved to France, but I haven't played since. I have, however, gone to Roland Garros a couple of times. I wonder when I'll go back. Remember fern bars? I just barely do; I didn't go to a lot of bars back in the day, although I did go to a disco or two. Stayin' alive, stayin' alive. I do remember one place in particular, though, and it was full of ferns. Mostly in pots hanging from the ceiling in macrame plant hangers. Remember those? These ferns are not in pots but grow in the woods along side the vineyard road. Today is la fête des mères in France, so Happy Mother's Day. It's also opening day for the French Open at Roland Garros. Almost miraculously, the clouds have gone away and the sun is out this morning, at least here. Paris is expecting partly sunny skies, but no rain. Good for tennis. We had light rain most of the day on Friday. I was able to get about an hour's work done in the garden before it started. I decided to postpone cutting the grass until Monday, but there are still several piles of cut hazelnut branches to make smaller and stack. I made some progress on that. Dew drops on a blade of grass. Today we're expecting more rain, but the system should be moving out. In fact, it's not raining now and hasn't since late last night (or, at least I didn't hear any rain during the night). 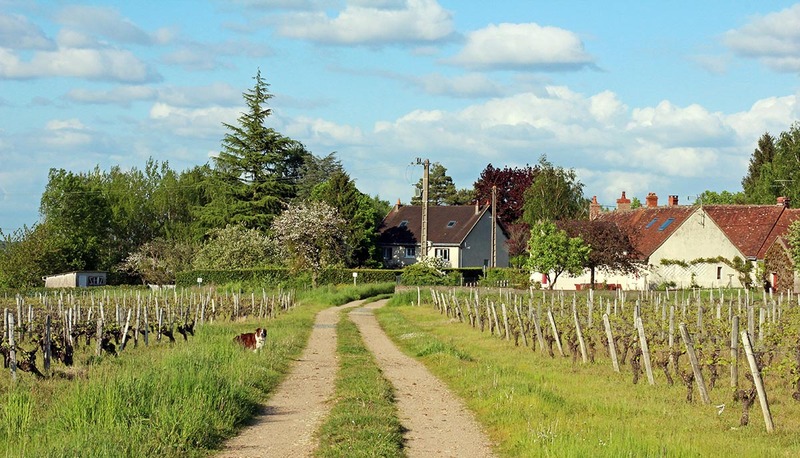 I'm going to the St.-Aignan market for asparagus; the season is going strong, but the end is coming. It's good to take advantage while we can. I have no idea what these are, but they're growing up against a stand of trees where they only get partial early morning sun (when there is sun). 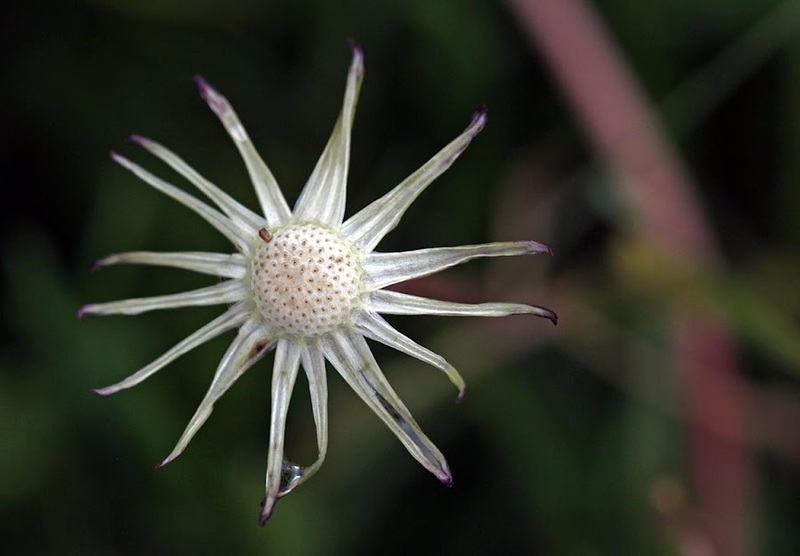 As the flowers open, the whole bunch of them turns upward and the flower head looks like wild carrot (Queen Anne's Lace). Could this be antrhiscus sylvestris? 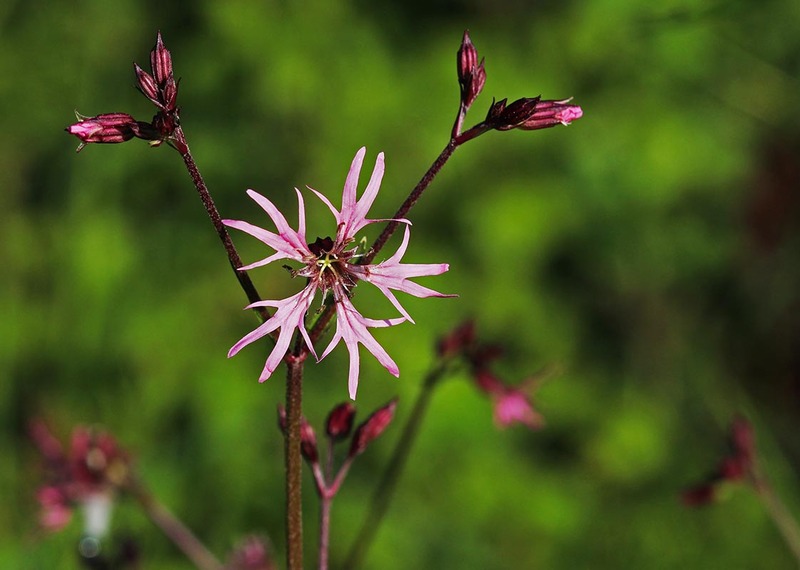 If you look closely you may see fine spider threads stretched between the flowers and the leaves on the left. It may be related, but I don't know enough botany to know. 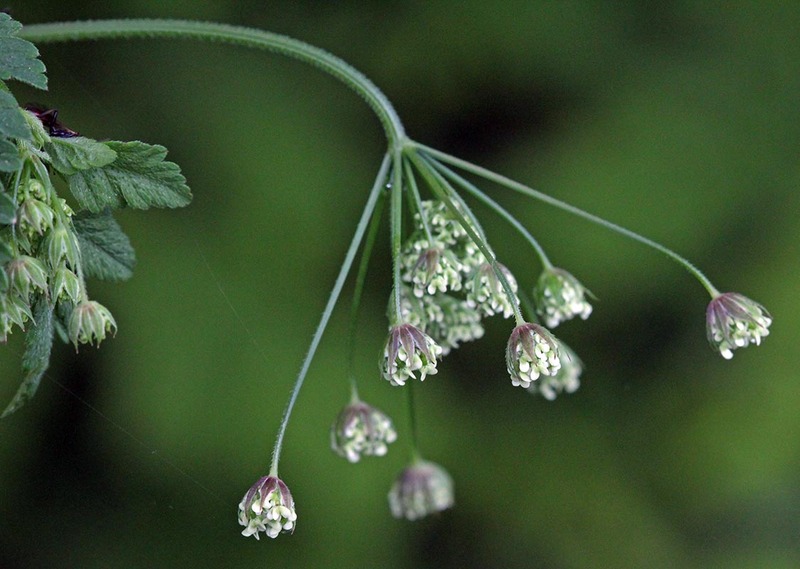 The plants I know as Queen Anne's Lace won't flower until sometime in mid-summer. Still, the white flowers are pretty right now, especially against the shadows of the adjacent woods. Here's Callie on Wednesday morning. We were all excited about the sun shining as we set out. But just after I took this picture, a huge mass of cloud covered the sky. We were shut back under the shadow. I couldn't help thinking of the Lord of the Rings; Sauron was again covering the world in darkness. Not long after I took this picture the sun went away again. It was nice while it lasted. I kept my eyes out for Nazgûl, but didn't see any. Thank goodness. The elves were smiling on us. We had a pleasant walk. I went for my haircut, then to the post office, then on to a store for some turkey on sale. Yippee! These plants are fairly common around here this time of year, so you'd think I would be able to get a better photo. But the paths and grassy areas I need to walk through where they grow are dark and wet. Tuesday was so dark that it felt like the middle of December instead of the end of May. 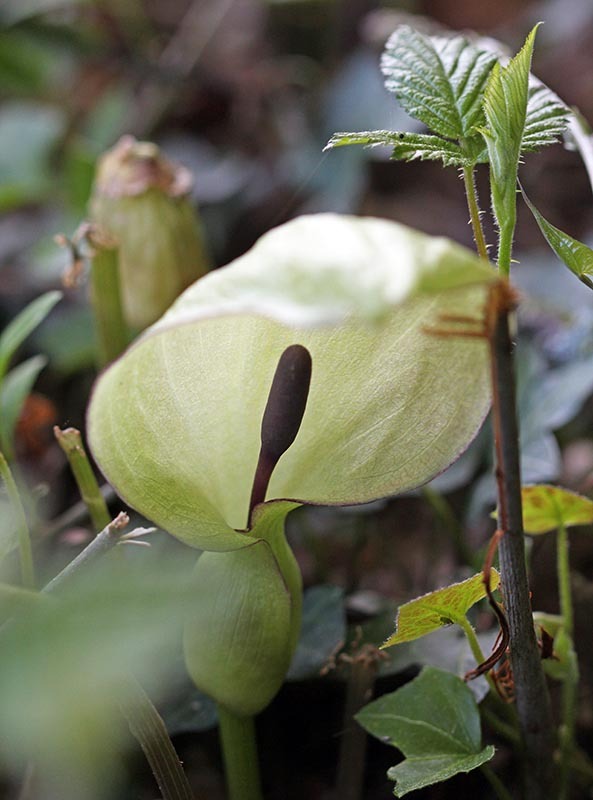 A jack-in-the-pulpit. They produce vivid red berries later on. But do not despair. At least not yet. The sky this morning looks clear and, even though the heat is on now, we may actually see some sun today. It's been raining for at least forty-eight hours now. If we weren't at the top of a hill I feel we could easily be floating away. Actually, there's not any threatening flooding going on in our parts at this point, but the Seine Valley up north and some places down south have been getting hit a lot harder. A view across the Cher Valley during a recent break in the clouds. You can see we're green, thanks to all the rain. This spring is definitely a wash-out. And the rain and clouds have meant not much sun to warm us up. I can really tell that the plants and flowers have slowed down considerably. The grass, however, is growing well. I also just read that Friday's low temperature is predicted to be 2ºC (that's just above freezing). At the close of last night's TF1 newscast, the anchor said, "Stay tuned, coming up next is the November weather forecast." Then, "Be sure to tune into our noon newscast tomorrow with Jean-Pierre Pernaut (the noon anchor) in his raincoat." Ugh. It feels less like the end of May and more like the end of March. The temperatures are low, and it keeps raining. Still, the flowering trees have flowered and the spring flowers have sprung. The only thing missing is some nice warm weather in which to sit outside and enjoy it all. 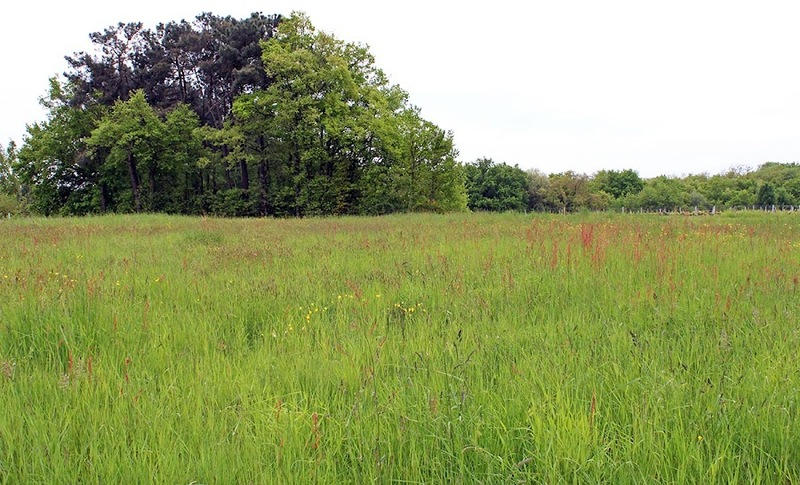 All the rain has helped the grasses and wildflowers to grow tall this spring. Oh well. We're hoping that this cold stuff doesn't mean that our summer will be a bust. But you never know. The summer of 2007 was damp and cold. This could be a repeat. We're almost nostalgic for the heat wave of 2003. Almost. Our local wine co-op had their annual open house last weekend, so Ken and I went over for some wine. We got a nice discount on forty liters and six bottles with an added bonus of a gift bottle of sauvignon blanc. We did a little tasting and saw some of the art on exhibit (a very talented macro photographer with a penchant for insects). 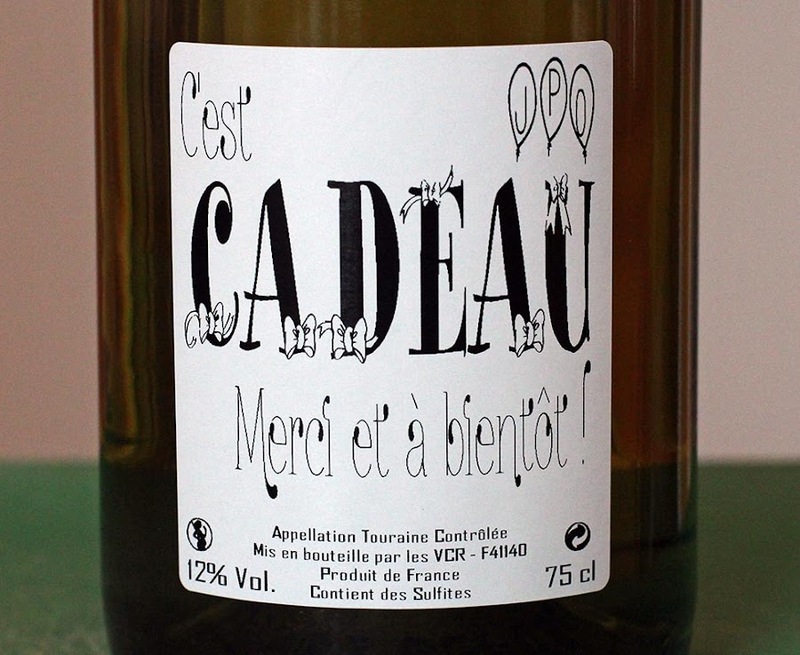 The label on our gift bottle. It says: "It's a gift! Thank you and see you soon!" I'm guessing the JPO inside the balloons stands for Journées Portes Ouvertes (Open House Days). I call the co-op "local" because it's right across the river from St.-Aignan. 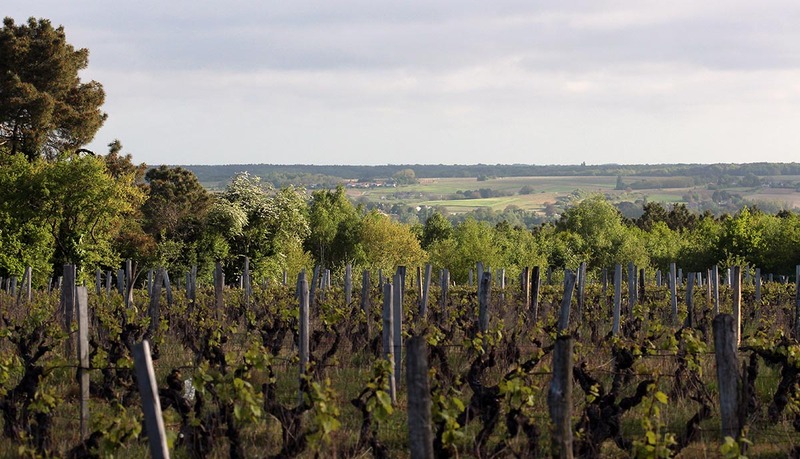 All the grapes they use come from that side of the river in the St.-Romain area; none of them are from our side. So, the wine is not as "local" as it could be. 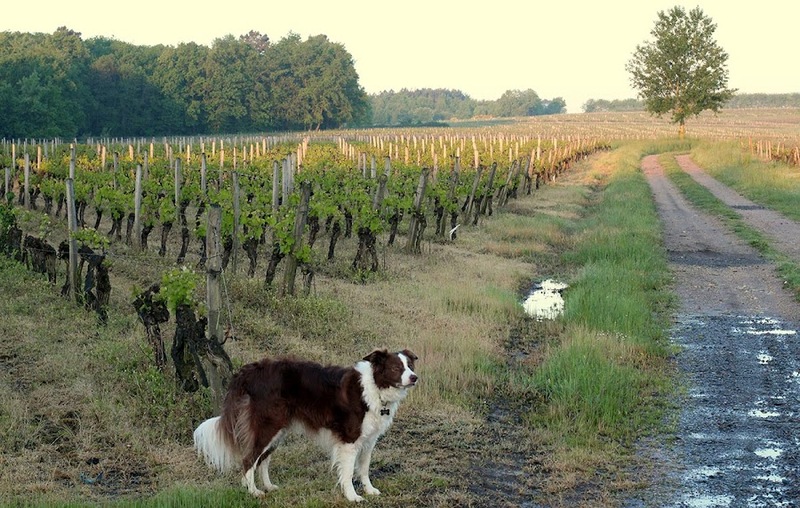 The real local wine comes from the grapes grown outside our back gate and we have to go to the winery for that! These little blue guys are blooming all over right now. They're tiny, but so numerous that they give the ground a blue tint. They grow among the grasses in and around the vineyard. They bloom in our lawn before they get cut by the mower, but they grow back and bloom again within the space of a week. 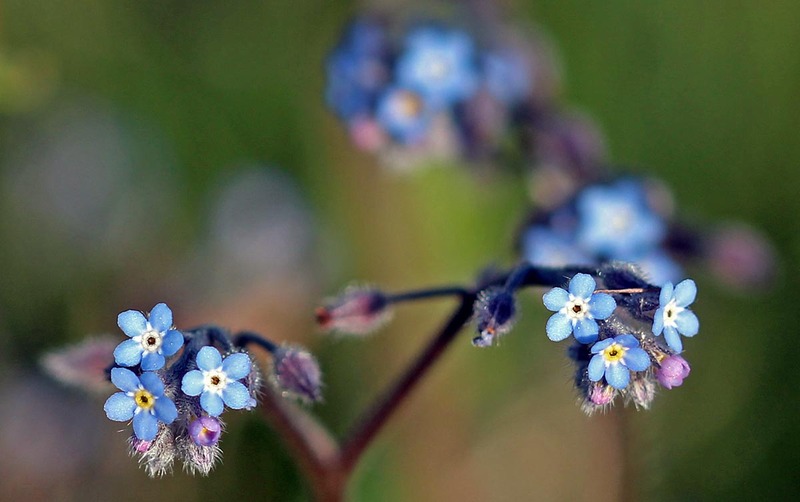 I believe these are a variety of myosotis, commonly called the forget-me-not. We're in the middle of asparagus season now and today I'm heading out to the morning market for another kilo. I want to make steamed asparagus with hollandaise sauce. I've never made a hollandaise (that I can remember), so we'll see how it goes. I'm also hoping for more strawberries and some mushrooms. My trip to Paris went well. I left on a 7:40am train from Saint-Aignan with one connection in Vierzon and arrived in Paris on time. I took a nice walk from the station through the center of the city, along the river, behind the Notre Dame cathedral, across the Ile-St.-Louis and over to the the big department store (le BHV) next to city hall. After a little targeted shopping, I was off to lunch with some American friends who happened to be in town on vacation. We ate at a favorite place of mine on the Place du Bourg-Tibourg in the Marais. 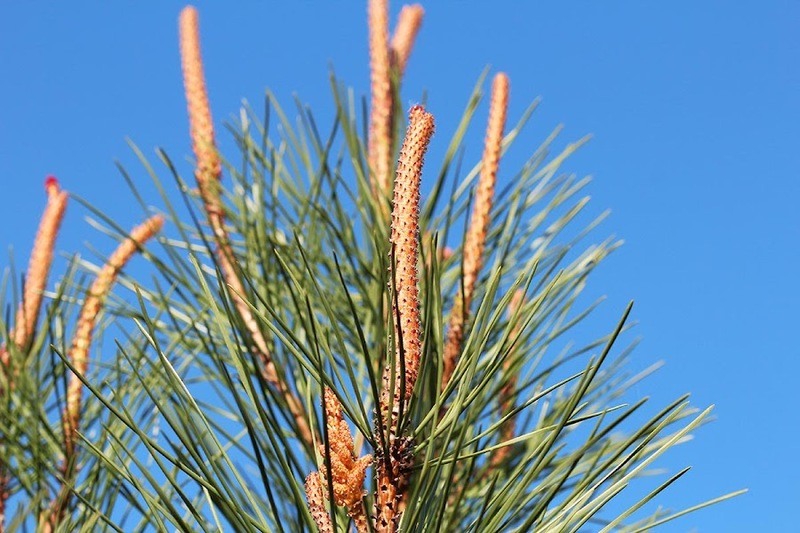 Flowers on a pine tree against a blue sky. After a fun lunch I hopped the métro over to Concorde and the American Embassy. The appointment for the notary service went smoothly and in all (including security) I was there for a little more than an hour. All the staff were friendly and efficient. After the paperwork was completed, I had time to stop in a favorite kitchen supply store before meeting up with another friend for a drink. I walked across the city from Les Halles to the train station (Gare d'Austerlitz) via Beaubourg, le Marais, and Bastille, which took about an hour. The train left just before 6:00pm and I got home at about 8:15pm. I didn't take my camera with me because the Embassy does not allow them, or any other electronic devices, inside. Since I didn't have anybody to wait for me outside with my camera, I decided not to take it at all. It was nice just to walk in the city without stopping to take pictures. The trains were clean, comfortable, and on time in both directions. All in all, it was very pleasant and successful day. I only know of two places out around the vineyards where these purple flowers bloom. I'm sure there are more, but I've only encountered the two on my routine walks with Callie. I can't find a match in the wildflower identification site I use, so if any of you recognize it, I'd appreciate your help. A pretty purple flower that grows in bunches around the vineyard parcels. Today I am on the road while Ken is home with the animules. I have to have a form notarized (a peculiar US custom) related to my retirement pension, and the US Embassy in Paris provides the service. So I made the required appointment and am taking the train up and back today to get it done. Every now and then I'll see something on the side of the vineyard roads that someone has tossed out the window of a car. Usually it's wadded-up kleenex (yuck) which quickly disintegrates and disappears. I've seen candy wrappers and the stray fast-food package; the town across the river got a McDonald's a few years ago. I've seen beverage cans, too. But often it's cigarette packs, empty, of course. 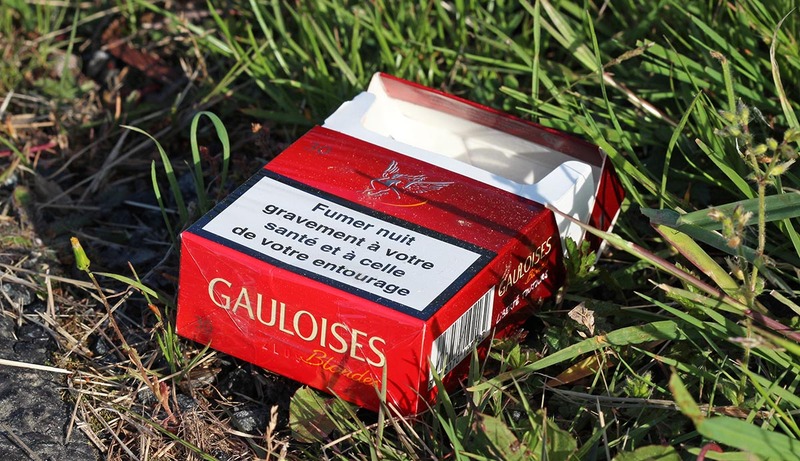 Gauloises Blondes. "Smoking seriously harms your health and the health of those around you." The weirdest (and by far the most gross) thing I've seen is a pile of human feces and the tissues used to "wipe" sitting right smack in the middle of the dirt road that Callie and I walk on every day. I imagine somebody really had to go and pulled off the paved road in the night. I had to steer the dog clear of that for a while in case she got any ideas. After a few days without any rain to wash it away, I noticed that somebody had actually come by and cleaned it up, presumably one of the vineyard workers. Ah, the country life! Callie waits for me to take a picture on our way home from our Saturday afternoon walk. By the time I get where I'm standing for this picture, Callie is usually already at the back gate (barely visible in the center-left) with whatever stick or log she's carried home. Hurry up! We're almost there. Our weather is decidedly spring-like. In other words, it ain't warm. Low pressure systems from the north Atlantic churn in one after the other over the British Isles and we get the tail ends of them here. Which means lots of clouds blocking the warm sun (Saturday was an exception, but it still wasn't what you would call warm). Oh well. Summer is on its way. Right? We wouldn't want to air our dirty laundry, now, would we? 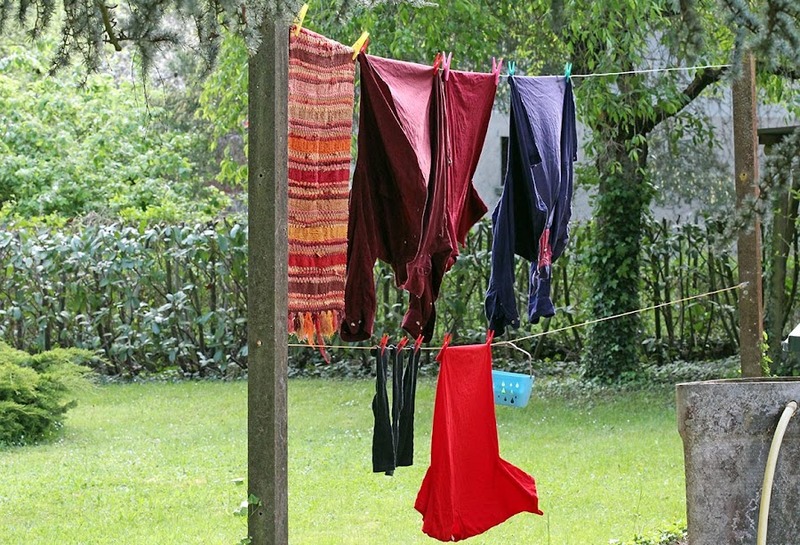 I thought the clothes drying on the line looked nice when Callie and I got back from our morning walk. So, why not take a picture? I thought our clothes (and a rug) looked nice against the green background. We had a long walk on Sunday morning. The sun was out and the grass was dry, so we walked around and around. Callie had a good time making her way ahead of me then realizing that I was not following exactly where she wanted to go. She always comes along wherever I am. Good dog. Actually, nothing smelled fishy. This fish smelled fresh and appetizing. We got a bar (sea bass) at the Saturday market in Saint-Aignan for our lunch. The fish monger scaled and gutted it for us so all we had to do was dress it and roast it when we got home. Ken used bay leaves and tarragon from the garden and sliced lemon to flavor the fish. He sprinkled a little hot pepper on top and added a bit of white wine to the roasting pan. Oven-roasted sea bass stuffed with fresh tarragon. Yum! The fish weighed about 850g (just under 2 lbs) before gutting. The result was tender and delicious. As a starter, we had some escargots de bourgogne (snails with garlic, butter, and parsley). These we bought frozen at the supermarket. 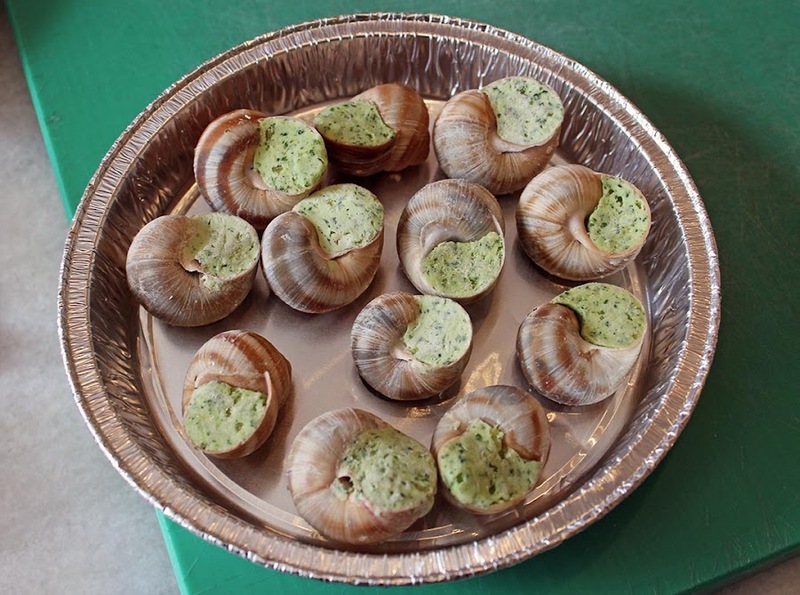 We just put them on this special aluminum snail dish and baked them until the butter was melted and bubbly. They were delicious, too, and surprisingly not very salty. We may have to sprinkle a little salt on them before they go into the oven next time. Frozen snails (stuffed in shells) ready for the oven. We served the snails with a nice dry Champagne. We ate the fish with broccoli and boiled potatoes and served it with a local chardonnay. In addition to going to the market on Saturday, we stopped in at our local wine co-op as they were having their annual open house. They gave us a 13% discount on some of our favorite wines along with a free bottle of sauvignon blanc. Such a deal! 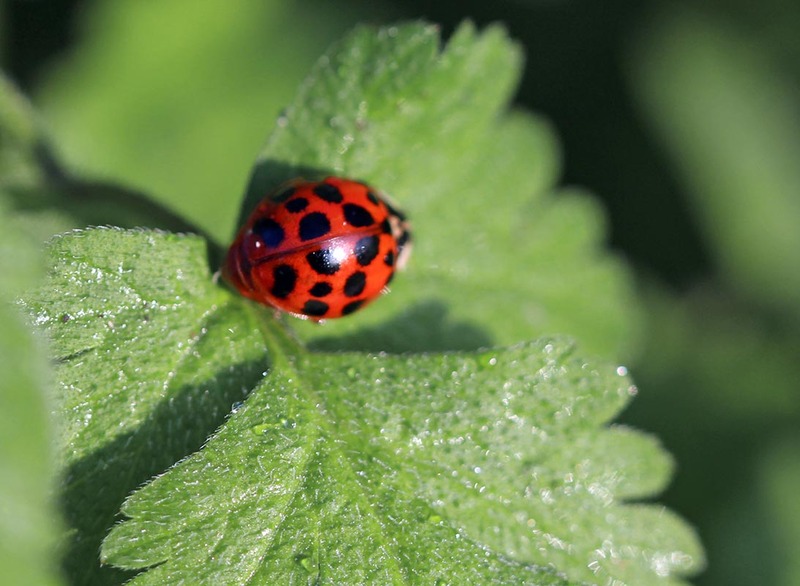 This is une coccinelle (ladybug). It was sunning itself on a leaf one recent morning, and it wasn't the only one. This seems to be a good year for these helpful little beetles. They're good for the garden. This is not Herbie. That's the sun reflected in its shell. Do you remember the series of movies in the late 1960s and 1970s (I think they were made by Disney) about Herbie the Love Bug? That wacky Volkswagen beetle with a mind of its own? Well, in France, those movies are on television frequently. The first film, "The Love Bug" is called "Un Amour de Coccinelle." The third film, "Herbie goes to Monte Carlo," is called "La Coccinelle à Monte-Carlo." Ken and I got married. We had a nice little ceremony under a tree in Albany's Washington Park. The wind was brisk, but it was a nice day. Today is our first wedding anniversary. 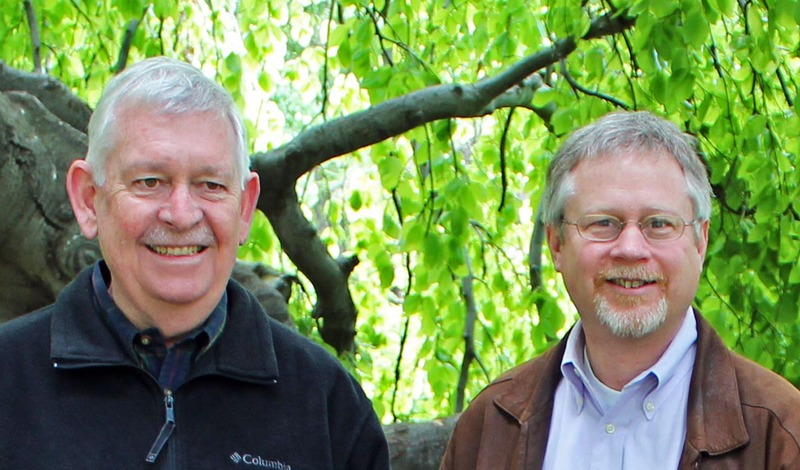 Ken and me in Washington Park, May 10, 2012. And we will soon celebrate thirty years of living together. We signed our first lease together on June 1, 1983, in Washington, DC. That was one long engagement. My how time flies. 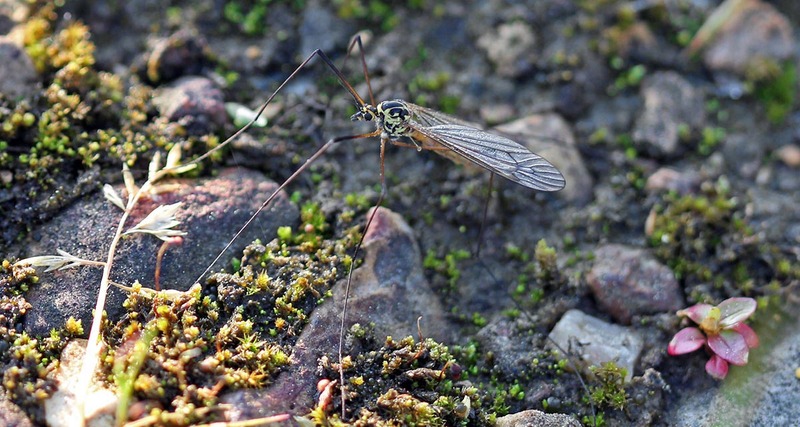 These large mosquito-like crane flies are abundant in the vineyard right now. They're especially visible in the mornings as I walk along the road or in the spaces between rows of grape vines. My walking disturbs them and they take off to fly out of my way. They're quite delicate and seem as though the slightest breeze could push them off course. My rigorous feeble attempt to identify this insect: I think it's a called a "tipule" (nephrotoma submaculosa) in French. This one landed in the clear not far from where I stood, so I was able to bend down slowly and get this shot before he (or she?) took off again. Recent mornings have been dew-soaked. While the roads and paths are dry, the grasses and plants are so wet with dew that Callie comes home from her walks soaking wet. And, as an added bonus, her wet fur picks up sand and dirt that has to be washed out of her coat before she can come back into the house. She's quite used to the daily "undercarriage wash;" it's part of her walk routine. 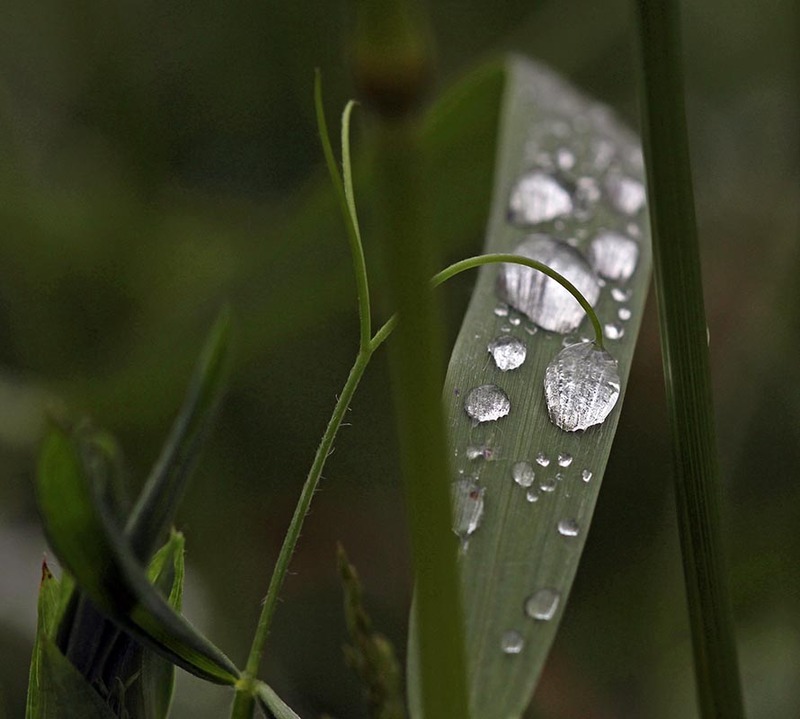 Dewdrops cling to the tips of the tall grasses in the vineyard. It's only on extremely hot and/or dry days, or extremely cold ones when everything is frozen, that Callie doesn't need a rinse off when she gets back from a walk. We're so lucky to have that shower in the utility room! Bert decided to join me on the deck Monday afternoon. We were enjoying the warm weather, even though the neighbors were out mowing, trimming, and using all manner of loud power tools. Oh well, I do the same thing, but usually just in the morning. Bert likes to hang out on the deck with us when the weather is good. 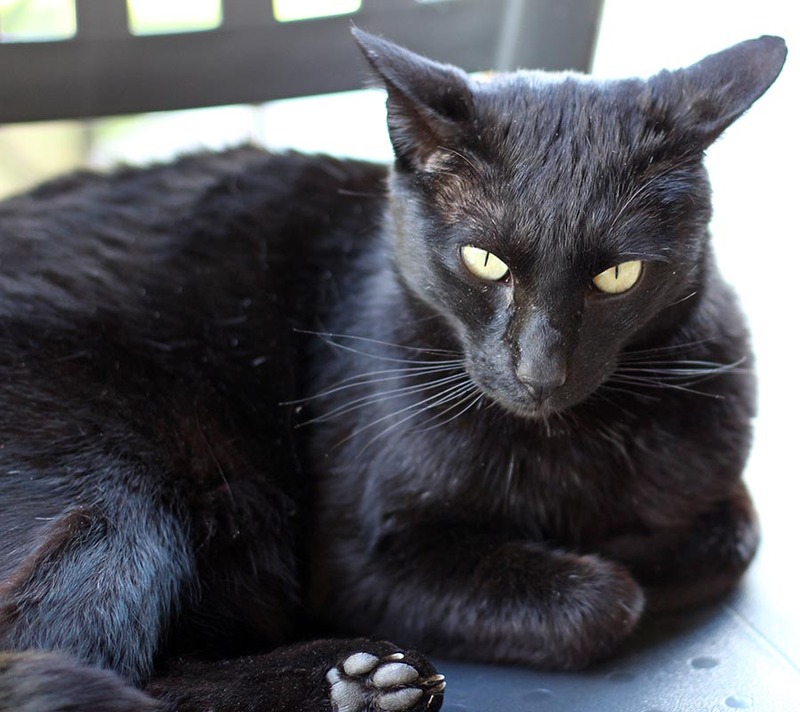 Bertie is an outdoor kitty and he spends his nights out prowling in the neighborhood. A few weeks ago I heard him screaming around 4:30 in the morning when he got into a fight with something, maybe a badger or a weasel, I'm not sure what. He's loaded with scars that are healing now. He may have used up one of his nine lives that night. On Saturday morning I went to the outdoor market in Saint-Aignan for some asparagus and strawberries. We are in the middle of our local white asparagus season and they are good! But the local strawberries are also good and I cannot help myself when it comes to strawberries. 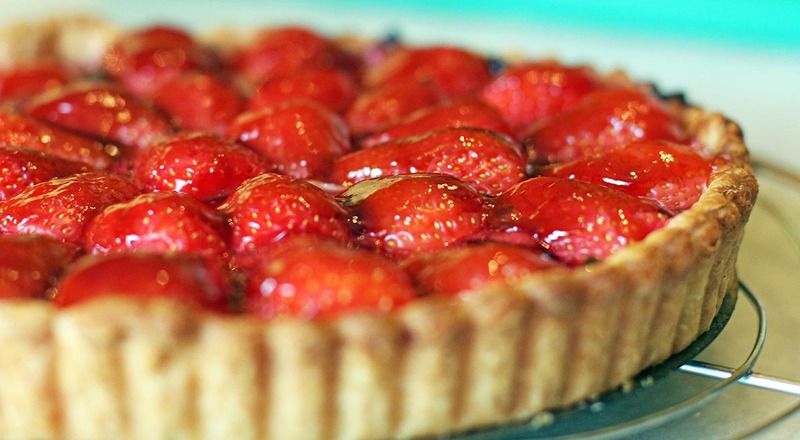 I love strawberries and I love rhubarb. Our local produce is fantastic. Another reason why I love living here. I picked a whole bunch more rhubarb from our garden and made a pie. This time I cooked the rhubarb pie before I added the strawberries (last time I cooked the berries into the pie). They went on fresh and were glazed with some rhubarb jam that we made last year. I also froze a bag full of rhubarb for later. And there is still more coming out of the garden. Yum. A note: Ken and I did not plan to post similar photos today. Sometimes it just works out that way! This is the other section of the hedge that got cut down to size. This part separates us from the neighbor just to the east of us (the section in yesterday's photo is on the west end of our property). There is a fence between us and this neighbor. We had half the hedge cut down to the level of his fence. The other half, to the right of this picture, is still at the original height of about seven feet. The much lower hedge on the east end of our yard. 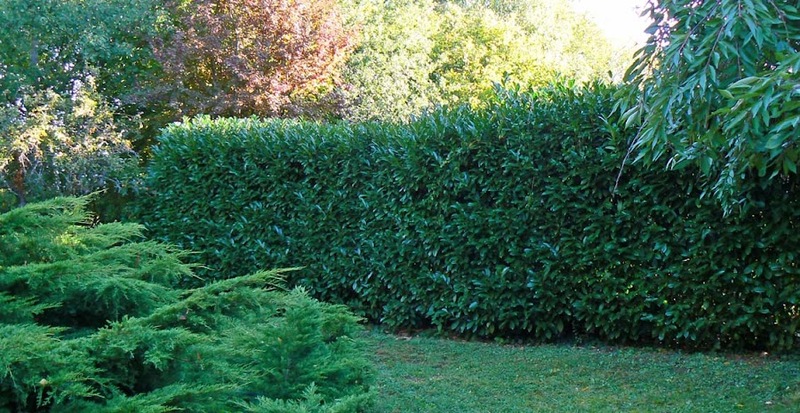 Again, maintenance will be much easier with the lower hedge. And since there is rarely anybody in the yard next door, we're not really losing any privacy. I found a photo from a couple of years ago to remind you of how high this section of hedge was. 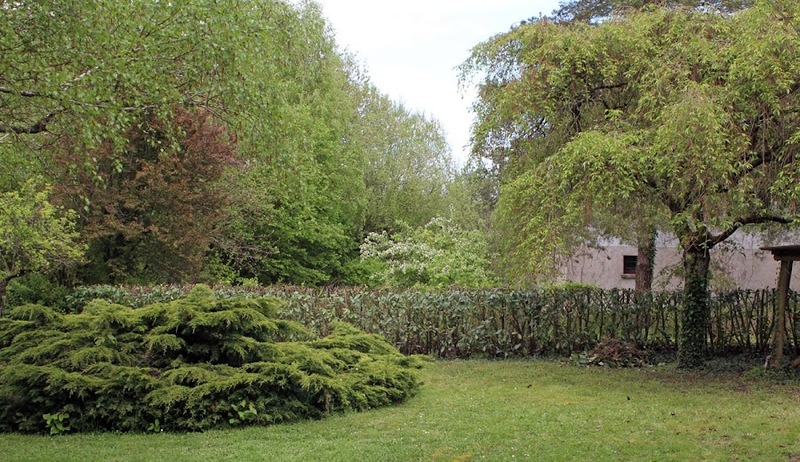 The same hedge, before cutting, from a slightly different angle, but you can see how high it was by comparing it to the tree on the left side of the photo. Our back garden gate. 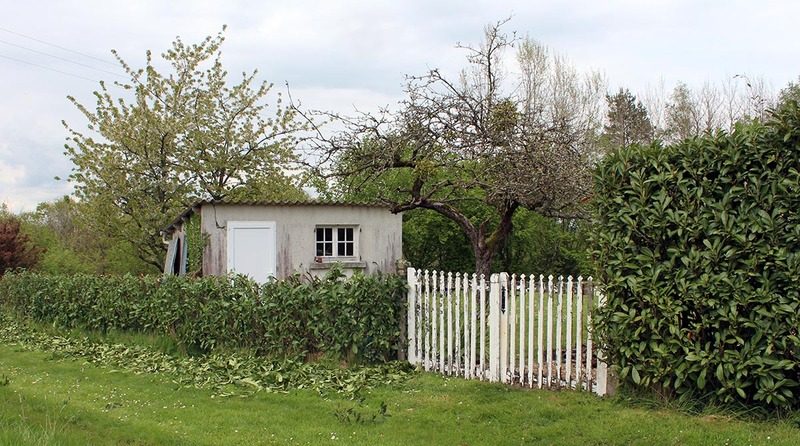 The garden shed is now more exposed inside the lowered hedge. The hedge section to the right of the back gate is not being cut down, but you can see how the section to the left is now much, much shorter. This section is between our back yard and the vineyard. What was once a dark spot in the yard will now get a lot more light. And I should be able to manage the hedge much better (and without a ladder) once it starts growing back. The depth of the hedge has also been reduced, but it was cut back on the yard side only; keeping its outside leaves will help it to live and grow (although I understand these things are pretty hardy and difficult to kill). It'll take a year or two for the pruned side of the hedge to fill back in with new growth. 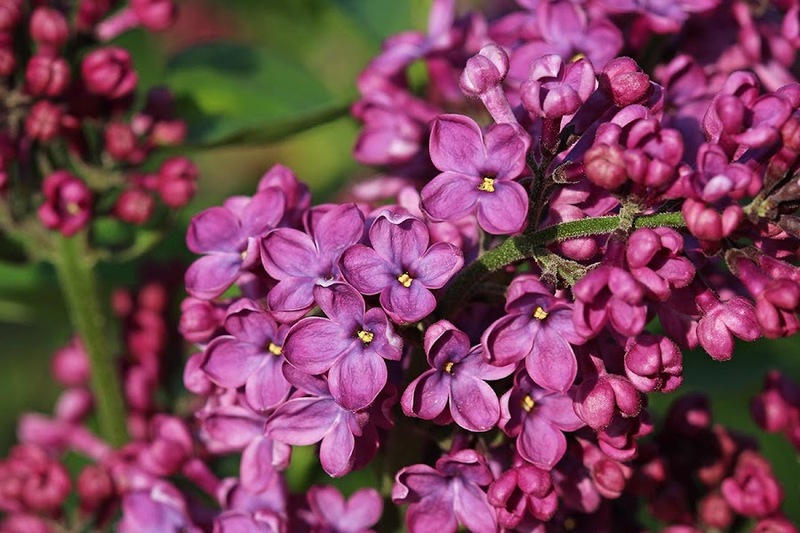 When I bought this lilac six or seven years ago, I didn't realize that it was a variety that bloomed every other year. I didn't even know there was a variety that only bloomed every other year. But as is my luck, if there is such a thing, that is surely the one I will end up with. Our lilac in flower. So pretty! This year is a blooming year for ours, which is great. Every other lilac tree in our neighborhood blooms every year. In the off years when ours is not in flower, I'm jealous. Oh well. I may have to break down and get another one. One that blooms every year, of course. We have a few tulips on the property. The bulbs that were here when we bought the house are brilliant red. There are two or three clumps here and there; I've dug them up and moved them around a little over the years. Then there are these that I planted eight or nine years ago. They have dwindled in number, but we still get a few flowers each spring. 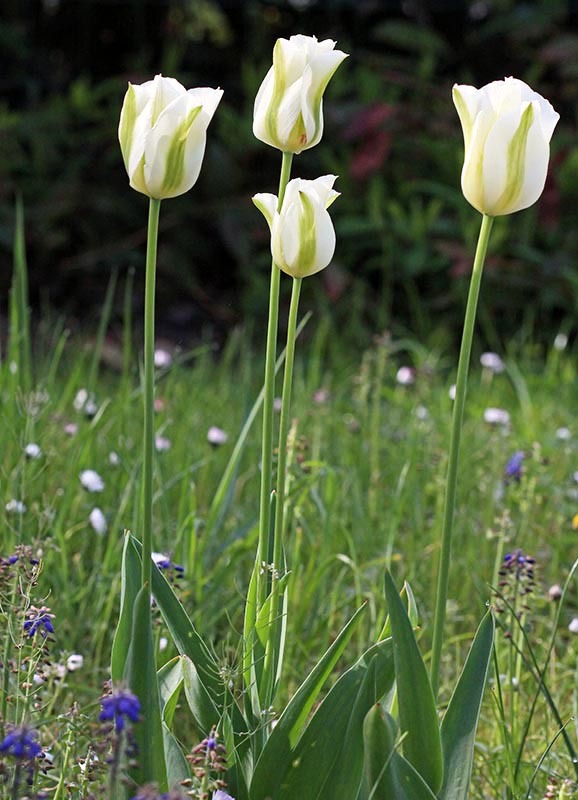 These were called "green tulips," but they're really white with a green stripe. I like them a lot. I want to get some more fresh bulbs this fall and start some new tulip beds out in the back garden. I know where I want to put them, I just have to remember that I want them when the garden centers have them. Tuesday was a very rainy day. It pretty much rained the whole day with a break here and there, but mostly there. I went out to do a few errands. First up, the bank in Montrichard. I had a check to deposit and a question to ask. All went well, except that the answer to my question about doing certain banking things online, although happily provided in the bank, did not prove correct when I got home. 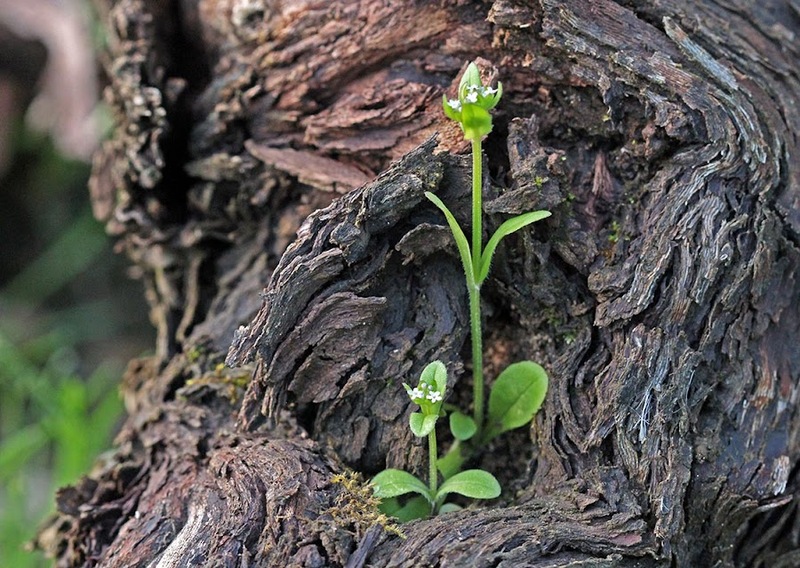 This tiny flowering plant is growing in the hollow spot of a grapevine trunk. So cool. Then I went to a grocery store for a few items and stopped at a garden shop on the way home for some bamboo stakes for the sweet peas. Now I'm wondering if they're tall enough. Oh well, I can work it out.